I am a postgraduate student of zoology at Palacky University in Olomouc, Czechia. My research concerns evolution and geographic variability in functional traits of Australian birds, gradients of species richness, mapping phylogenetic and functional diversity, and analysing community structure at different spatial and time scales. Supervisor: doc. Vladimír Remeš, Ph.D. Supervisor: doc. RNDr. Jaromír Hajer, CSc. Senckenberg Biodiversität und Klima Forschungszentrum (SBiK-F) in Frankfurt am Main, Germany (Support of Academic mobility at Palacky University Olomouc). Mentor: Dr. Susanne Fritz. Senckenberg Biodiversität und Klima Forschungszentrum (SBiK-F) in Frankfurt am Main, Germany (Erasmus+ internship). Mentor: Dr. Christian Hof. Remeš V. & Harmáčková L. (2018): Disentangling direct and indirect effects of water availability, vegetation, and topography on avian diversity. Scientific Reports 8: 15475. Harmáčková L. & Remeš V. (2017): The evolution of clutch size in Australian songbirds in relation to climate, predation, and nestling development. Emu - Austral Ornithology 117: 333-343. Friedman N. R., Harmáčková L., Economo E. P. & Remeš V. (2017): Smaller beaks for colder winters: Thermoregulation drives beak size evolution in Australasian songbirds. Evolution 71: 2120-2129. Harmáčková L. (2015): Galerie českých malířů ptáků: Lenka Harmáčková. Sluka 11: 69-73. • Macro 2019, 11.–14. March 2019, Würzburg, Germany. • Zoologické dny, 7.–8. February 2019, Brno, Czechia. • International Biogeography Society 9th Biennial Meeting, 8.–12. January 2019, Málaga, Spain. • Zoologické dny, 8.–9. February 2018, Praha, Czechia. • 10th Annual Meeting of the Specialist Group on Macroecology of the Ecological Society of Germany, Austria and Switzerland, 19.-21. April 2017, Vienna, Austria. • Zoologické dny, 9.–10. February 2017, Brno, Czechia. • 58th Phylogenetic Symposium, 18.–20. November 2016, Leipzig, Germany. • Zoologické dny, 11.–12. February 2016, České Budějovice, Czechia. • Zoologické dny, 12.–13. February 2015, Brno, Czechia. • International Biogeography Society 7th Biennial Meeting, 8.–12. January 2015, Bayreuth, Germany. • Zoologické dny, 6.-7. February 2014, Ostrava, Czechia. Member of the Czech society for ornithology. 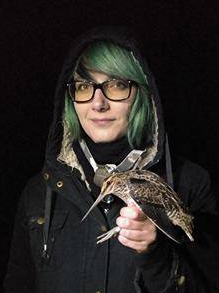 Holder of the bird ringing licence. Participation in various educational events for public.